We got back to Morro Bay this afternoon and I finished sewing the binding to the third placemat in the set of three that I’d been making for my cousin. This was a fun little project and a good way to use up scrap fabric. 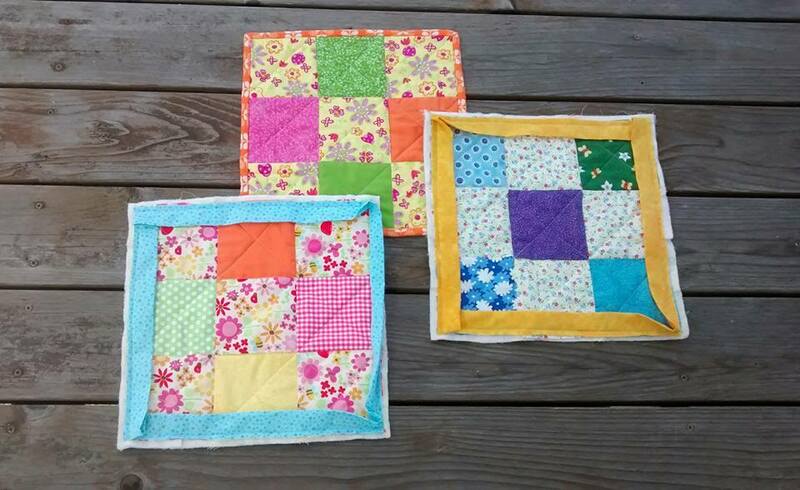 I’ve been enjoying the sewing and quilting process. 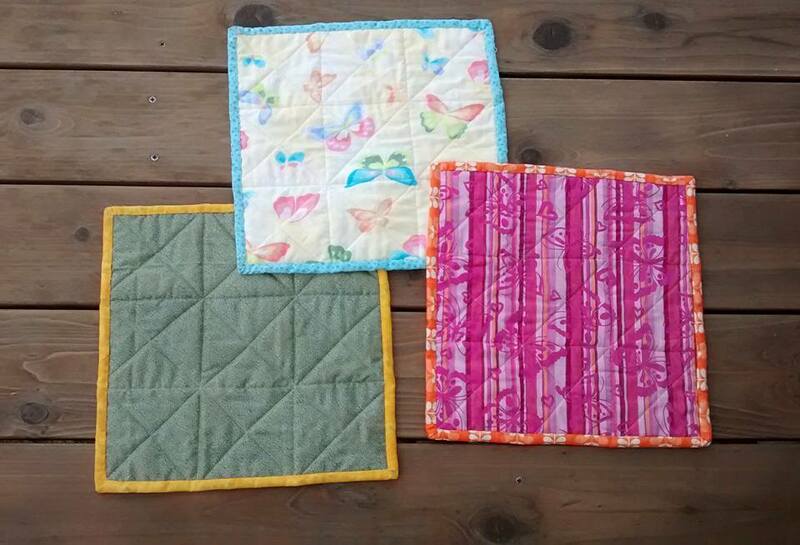 Now I’m thinking of sewing more napkins or making a quilted table runner. 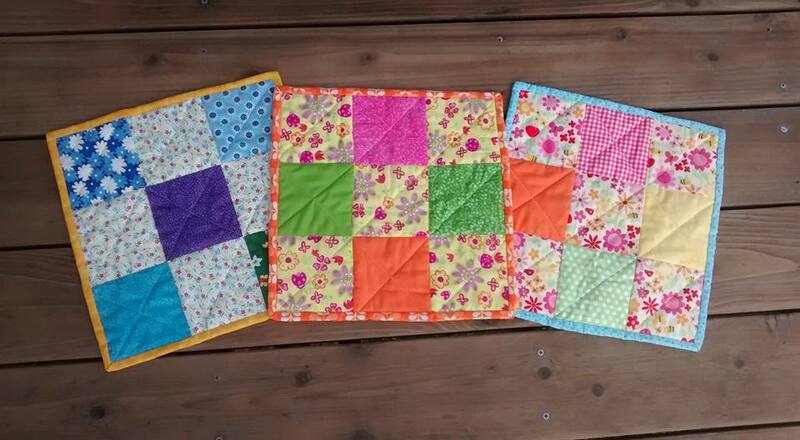 Categories: Handmade | Tags: nine-patch blocks, patchwork, patchwork blocks, patchwork quilting, quilted, sewing | Permalink. Day 213/365: Quilted Placemat #3, So Close to Done! We’re at the Ventura homestead this weekend, and once again, the problem with keeping two residences has reared its ugly head. 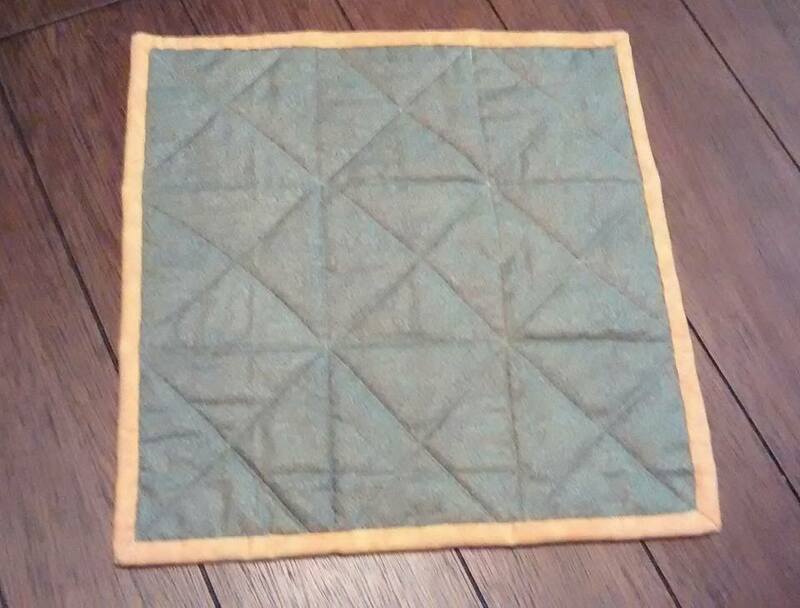 I was hand-sewing the binding on my third quilted placemat, and I ran out of thread. I hadn’t thought to bring more thread with me, and all of my sewing notions are up in the Morro Bay house. So I can’t finish the placemat until we drive back to Morro Bay tomorrow. This isn’t the first time that Sean and I have been at one place and realized that something we needed was sitting at the other place, 150 miles and two counties away. Last week Sean brought his computer up to Morro Bay and discovered that he’d left the power cord back in Ventura. But there are worse problems in the world. 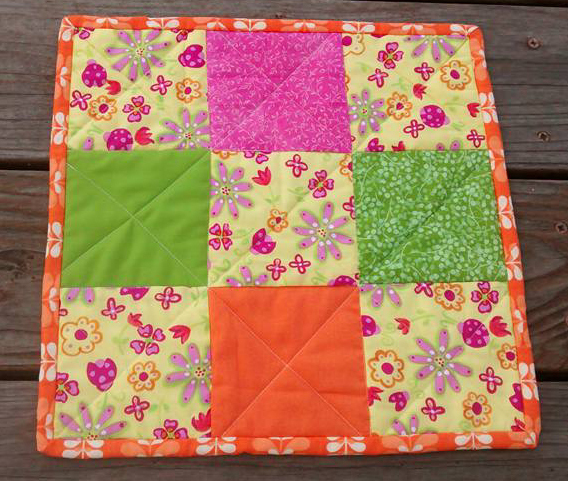 Categories: Handmade | Tags: patchwork blocks, patchwork quilting, quilted, Ventura | Permalink. Last night I finished hand-sewing the binding to the second quilted placemat in the set of 3 that I’m making for my cousin. 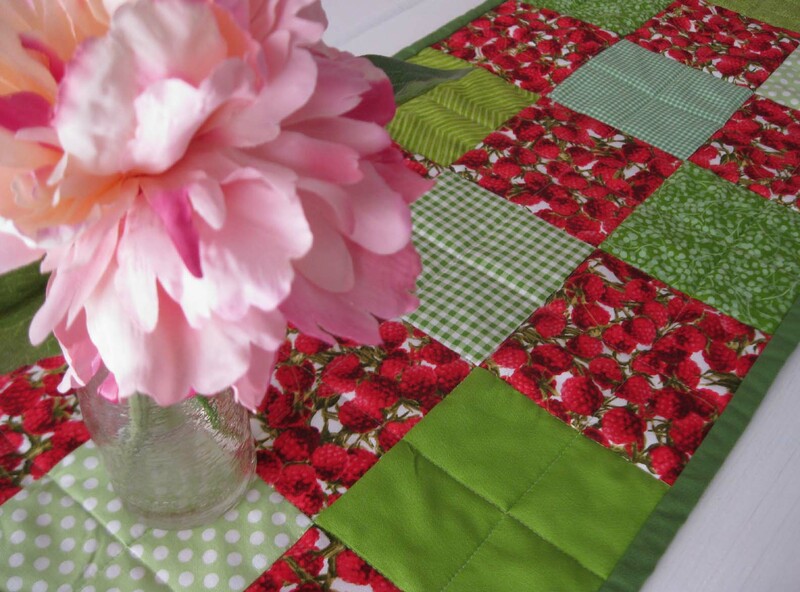 Categories: Uncategorized | Tags: patchwork, patchwork blocks, patchwork quilting, quilted, sewing | Permalink. All that remains now is to hand-sew the binding in place. 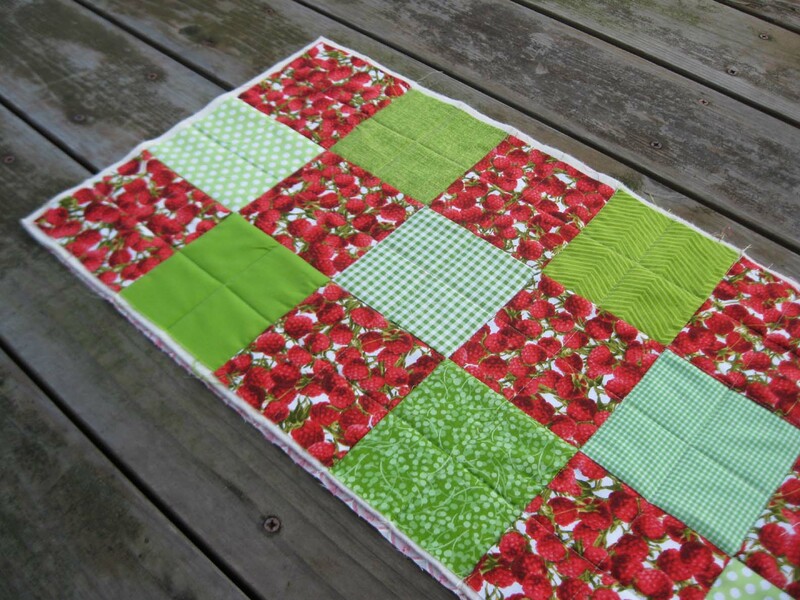 Categories: Handmade | Tags: nine-patch blocks, patchwork, patchwork blocks, patchwork quilting, sewing | Permalink. Remember the nine-patch blocks that I sewed last weekend, and the quilted placemat that was just waiting for me to hand-sew the binding in place? So I finally got around to doing that. I also spent some time today going through the fabric stash and slicing, pressing, and sewing together binding strips for the other two placemats that I am making for my cousin. I plan to work on them a little at a time this week, so they should be done in a few days. 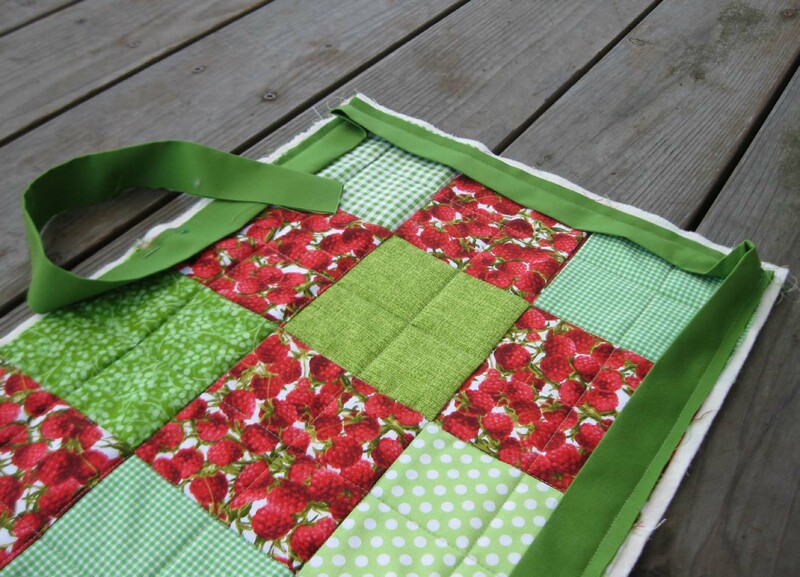 Categories: Handmade | Tags: patchwork, patchwork blocks, patchwork quilting, quilting, sewing | Permalink. I got all the way to sewing the binding (or border, as Sean calls it) around the quilted placemat. Now all I need to do is sew it down by hand using the ladder stitch. Yeah, that’s probably not going to happen any time soon. 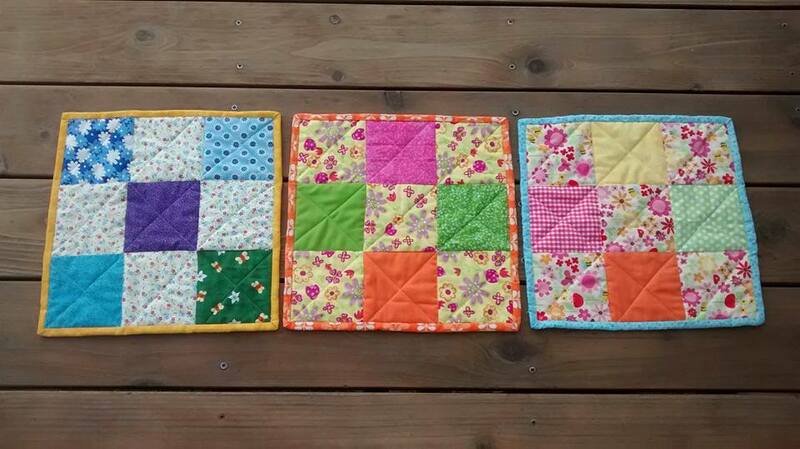 Categories: Handmade | Tags: nine-patch blocks, patchwork blocks, patchwork quilting, quilting, sewing | Permalink. I loved Laura Ingalls Wilder’s Little House books. Reading about Laura and her sister Mary sewing on their quilts is what first got me interested in quilt-making. 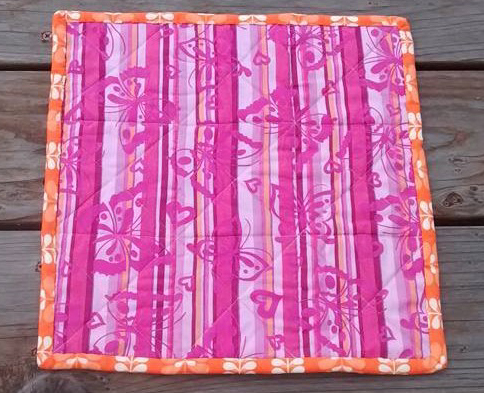 Of course I had no clue how to make a quilt, let alone how to start the process. This was in the early eighties, and I lived in a traditional Filipino household in rural Hawaii. All I knew was that I wanted to be sewing on a quilt, too. Anyway, then I read Lois Lowry’s A Summer to Die. I must have been about eleven or twelve at the time. (Another aside– when I think about it now, that is really heavy subject matter for a kids’ book. I mean, a story about your fifteen-year-old sister’s final stages of life– a summer to die— Really?) 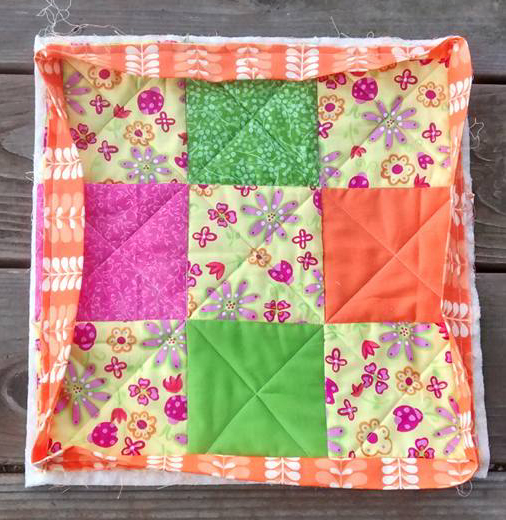 So while it was a very stressful time for everyone in the family in the book, the mother of the narrator started a patchwork quilt, using fabric from her daughters’ outgrown childhood clothing. And the idea of that quilt stayed with me. I moved on to other books and other interests. I taught myself how to crochet from a library book when I was in the seventh grade. I went on to high school, undergrad, and then graduate school. I got a master’s in creative writing. I went out into the job market and landed in teaching. Time passed. I didn’t even recognize it, but looking back now– I was unhappy and depressed. I wasn’t doing the things I loved. It finally took some prodding from Sean and a move across the country for me to admit that I needed to make drastic changes. Or else I would be dying the slow painful life of a central Florida middle school teacher bitterly counting the years to retirement. In 2003, I went back to graduate school in a completely different discipline. To deal with the stress of being a broke, thirty-something-year-old grad student, I learned how to knit. I knitted and crocheted through years of three-hour-long classes, eight-hour-day seminars, multiple unpaid traineeships, a dissertation, pre- and post-doc internships, four separate licensing exams, and finally, finally, I got to the point where I was securely established in a full-time permanent state job with benefits and a pension. I was a long way away from the little girl who liked to read all the time and write stories and daydream about making a patchwork quilt out of old faded gingham dresses. Then it happened just a little over three months ago. Back in September, when my colleague and I should have been watching a webinar but were reading the newspaper instead, I noticed a small ad for a local fabric shop, Picking Daisies. 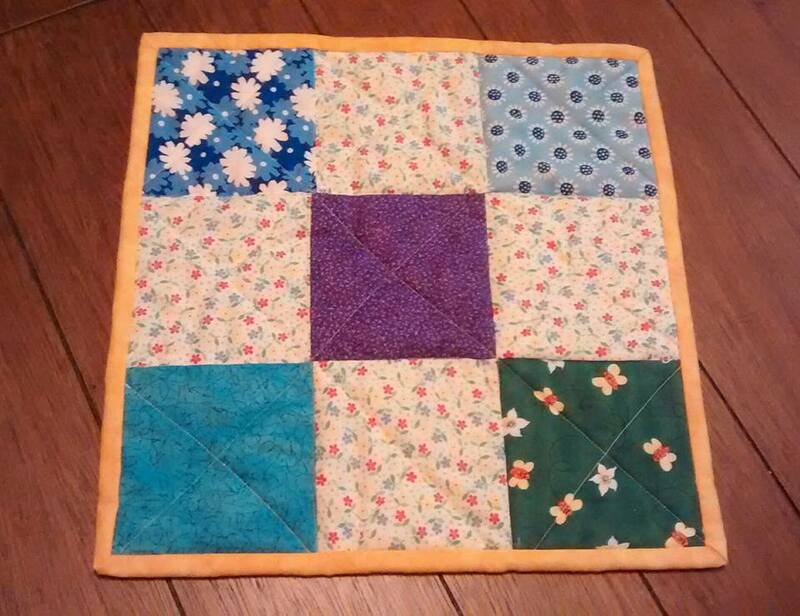 They were offering a beginner’s quilting class, and the featured project was a patchwork quilt made out of blocks. After all these years, it came at just the right time. I was in the right place. 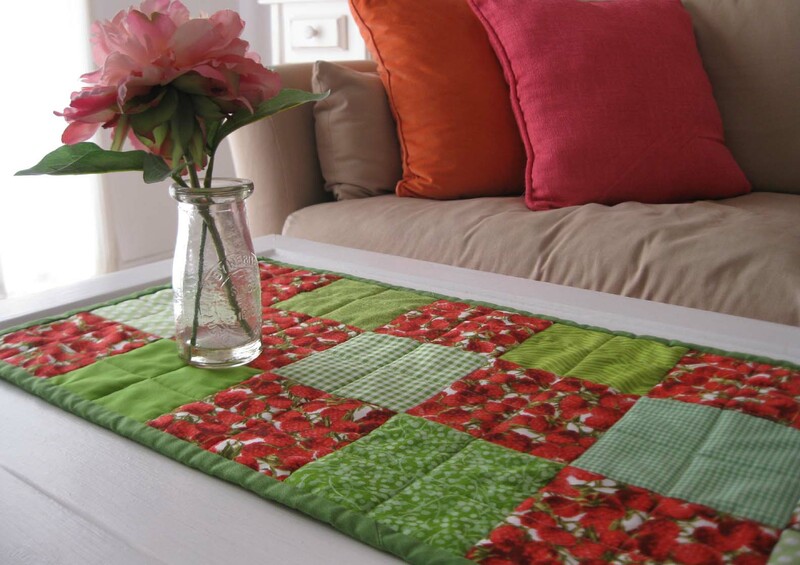 Categories: Handmade | Tags: crochet, Hawaii, knitting, patchwork quilting, quilt-making, quilted table runner, quilting, quilts, Sean | Permalink.